Are Diet Pills the Right Treatment to Lose Weight? Excess weight can have negative consequences on health and should be avoided. With obesity rising in the Western world, there is now a huge industry surrounding weight loss. Keep reading to discover more about the role that diet pills play in this business and whether they are the right treatment to lose weight. There are a number of causes for weight gain, with the main reason most of the time being an unhealthy diet and a sedentary lifestyle. Many studies have shown that stress, dehydration, and lack of sleep are all factors that increase the chances of eating more and exercising less. Ill health and frailty can also cause weight gain because the person is unable to exercise. Being overweight can be psychologically distressing, sometimes leading to anxiety or depression, and can also increase the risk of developing certain physical illnesses, such as heart disease and diabetes. Diet pills are one possible solution for weight loss, and these can come in either pharmaceutical or herbal form. The two main types of diet pill are pharmaceutical or herbal, although there are a lot of variations within these categories. The pharmaceutical variety include prescription weight loss pills and ones that can be bought over the counter. The effects of a weight loss pill will vary depending on the person and will also depend on which type of pill is being taken. Herbal weight loss pills are unregulated, so weight loss claims by manufacturers are often utterly overstated; for example, even though some studies have shown that people who drink green tea for years might have a lower risk of gaining weight, there is not enough evidence to support the claims on green tea supplement bottles saying that taking the pills will “burn fat.” Additionally, there are some herbal remedies that can have unpleasant side effects; the herb Aristolochia fangchi, for example, is promoted as effective for weight loss, but it has been linked to an increased risk of kidney failure. 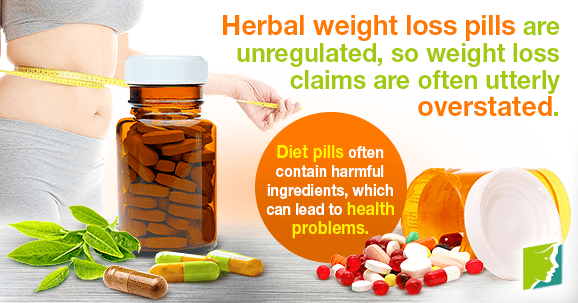 Many pharmaceutical weight loss pills that can be bought without a prescription are unfortunately not much safer than herbal diet pills, nor are they more likely to work. Some might lead to temporary weight loss, but this is not maintainable if not combined with a healthy lifestyle. Moreover, these diet pills often contain harmful ingredients, which can lead to health problems. These harmful substances include conjugated linoleic acid (CLA) and triiodothyroacetic acid (TRIAC). Side effects of these constituents can include diabetes, gallstones, and an increased risk of heart attacks and strokes. Unfortunately, there is no effective substitute for a healthy diet and active lifestyle. Unlike diet pills, developing good habits are a cheap, healthy, and risk-free way to lose weight. Some people might find that starting off a weight loss program with diet pills can give them a kick-start, but they should not be a long-term solution. If you do still decide to start taking pills, it is essential that you first talk to a medical professional, who can give more specific advice on which types are appropriate for you. Losing weight and getting healthy can be challenging goals, but they do not have to be impossible. Click here for a four week plan to lose weight.